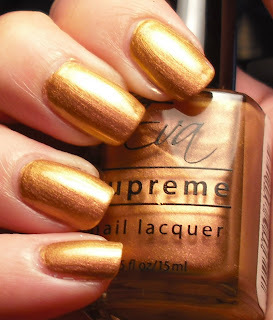 Anyways, Eva is polish brand I've been able to find at a few Walgreens here in Orlando. I think they are based out of Miami, and I'm not sure if anyone has been able to find these anywhere outside Florida? They make your standard colors but they also make a few unusual ones. Check out my other Eva post to see the other colors I have. I happened to find another great color from this brand that happens to be a duochrome! Yes this all the same bottle of polish! This varies from a bronzy-pink, to a rose gold, to a straight up gold depending on the angle. It is a great duochrome it's not subtle at all. It's gorgeous!!!! I don't have any other words for it. I don't mind unavailable products reviewed on blogs. As long as it's stated as such. And, if you know of a sorta dupe on it, that would be a plus. Show off your polish! If you bought something and like it, show it off! 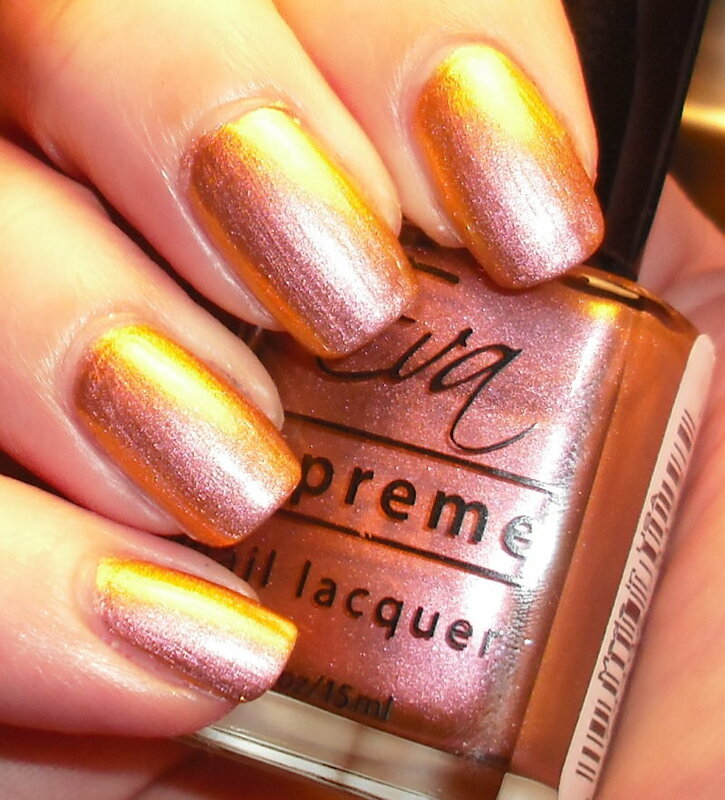 And if you put the Eva polish in a giveaway, just let people know and they can decide if they want to participate. Thanks for all the swatch photos! Yes, please post Pink Me, I'm Good! I adore OPI and will drool over any OPI swatches. what... i'm so confused with this polish.. pink!! gold! pink!! Kimberly-Yeah, the name isn't very exciting it's just "Mine"
Twister- Thanks! Thanks for you input on the giveaway and the OPI! Ice Queen- Thanks for the advice! I'm going to look for more bottles tomorrow. If I can't find anymore I'll at least have 1 bottle to giveaway! Jana-Thanks! Thanks also for you advice on the giveaway and OPI! Pretty- I found these at a few random Walgreens. I have a feeling they are only in Florida though since I haven't seen anyone else post them and the brand is based in Miami. Looks kinda like "Dancing Nails" from SinfulColors.